THE FORT WAYNE SENTINEL. SATURDAY. FEBRUABY 19, 1910. Following the fall of “Jack” Broughton, the founder of the science,at the hands of jack Slack in 1750,the title was bandied around among a number of obscure boxers, none of whom was qualified to hold the honor. Not until the rise of Tom Johnson did a man appear worthy to be counted a successor to the first great master. following them Jacob’s will be paired with Big Ben Brain, Pickard with George Ingleston, the brewer, Fualkner with Watson and Thornhill with Hooper. Such will be the tournament the greatest ever held in England and one that will demonstrate where is bred the best of brawn. The history of pugilism has little to say about the result of this matching of men except as to the outcome of the battle between Perrins and Johnson , a battle such as seldom has been seen in any country. All England was wrought to a fever pitch and men discussed the approaching contest as today is discussed the contest between Jeffries and Johnson. The methods of producing fighters today are vastly different from those known a century and a quarter ago.now the question is asked can Jeffries at the age of thirty four hold his own in the ring with a younger man .Age with him is considered a handicap and yet in “the good old days” men were not thought well hardened for the ring before they had turned thirty. Tom Johnnson was born in 1750, the same year that saw the downfall of Broughton and the accession of Slack. His real name was Jackling. His greatest battle, that with Perrins, was fought when he was well into his fortieth year and at that period he was entering the zenith of his fame. Perrins , a few months younger than Johnson, had been even slower than the champion in his development. But the two at the time of their clash represented the two greatest schools that have existed in pugilism since men first met in the squared arena. Johnson by no means a pigmy, even amongst men of muscle, depended fully as much on science as he did upon his well recognised ability to land a crushing blow. Some regarded him as the inferior of Broughton in science, others maintained that in Johnson the prize ring had found its master of science. His height was two inches under six feet and his fighting weight was 14 stone .Quickness, courage and a knack of throwing himself behind a decisive blow were the main characteristics that had brought him his laurels. All these characteristics of the champion were explained by Mr. David Seth, as he ran over the possibilities of the battle. "But," he continued, "there are other fighters besides Johnson who may rightly lay claim to the championship. Our own Isaac Perrins a rugged mountain of a man, six feet two inches in height and weighing seventeen stone when stripped for action. Yet you have seen him know that he carries his ponderous figure with all the ease of a stripling. I have seen him lift eight hundred weight of iron into a wagon and perform other feats of strength almost beyond human credibility. And so despite the reputation with which Tom Johnson will come from London we will take little risk in laying the odds on Perrins. Of Isaac Perrins a historian of his time wrote “ His tremendous breadth of chest and cleanly muscled limbs tell of perfect condition. His countenance open and expressive, is lighted by a mild and friendly glance. No one has ever had cause to say that Isaac Perrins makes ill use of his powers. He is gentle and considerate and above all things seeks to avoid offence to those weaker than himself". And so the plans and the arrangements set for the meeting between Johnson and Perrins. Mr. Seth received In person from Johnson a reply to a letter showing clearly enough the champions readiness to accept any offer so well backed as that of Perrins. After some further correspondence it was agreed that meeting should take place at Newmarket on the turf, for 250 guineas a side, two-thirds of the gate money to go to the winner and the rest to the loser. The first arrangement was for October 1, 1789, but Interference by the authorities resulted in a postponement, and the men finally clashed at Banbury In Oxfordshire, October 22. 1789. Some five thousand persons were gathered In and about the Oxfordshire town when the day came on which the champion was to defend his title against the Birmingham giant. The spot chosen was an open field that sloped down slightly toward the centre. Here a stage was erected, twenty-four feet square and five feet above the ground. In accordance with general custom it was carefully covered with strips of turf packed and pounded solidly. The Birmingham followers of Perrins had come down well supplied with money for the betting.They felt no doubt in the superiority of their favorite And were prepared to give two and even three to one on him. Notwithstanding the fact that Johnson's success had been almost phenomenal, these enthusiasts could see no way by which he could stand against their mighty challenger. Johnson, more than any of his contemporaries, "fought with his head." Observant followers of the sport began to point him out at an early stage of his career as a man who had a future. On entering the arena it was his custom to study his adversary with caution while remaining on the defensive, seeking to oppose tactics that would be most effective against the methods employed by the adversary. He played, usually, a waiting game, in which his remarkable coolness, judgment and control of temper gave him great advantage. It was never Johnson's way to risk anything that could be better gained by tiring an opponent Repeatedly critics of the day had observed that he came through a grueling fight almost unscathed and fresh in body and wind. Avoiding with scrupulous care the least unfairness, he adopted every legitimate means to foil and baffle his enemy in such a way as to greatly try his confidence and self command. The man who allowed anger to master him while he fought with “Tom” Johnson was lost. Johnson himself never grew angry or vindictive or hurried. He held off, calm, alert, nursing his reserve against the crucial moment. He had found no flowery path to the championship. Entering the ranks of the boxers at the age of twenty three, without friends or record, lie had forced his way up by a series of difficult battles against men superior to him in weight, strength and experience. He had never been able to rush and overwhelm an opponent and even a second class competitor could Stay in the ring with him for round after round owing to the slow method he was compelled to follow. Some or his hardest fights had been with Jarvis “Death” Oliver, the Croydon Drover, Fry "Bill" Warr and Michael Ryan, whom he met twice. He, now stood the acknowledged head of the sport, without a single defeat back of him. The morning of the fight which was to go down to pugilistic history as one of the hardest, cleanest and most brilliant encounters that ever took place.At an early hour the crowd began to surge out upon the downs and take up positions within the roped space about the stage. Men thrust and elbowed for advantageous points with the easy democracy of sports followers, and the increasing hubbub rose with sun toward the appointed time. Supporters of Johnson were not so numerous as those of Perrins, and the odds of two and three to one on the Birmingham boxer prevailed among the few who were ready to venture a wager before the beginning of the conflict. Johnson was the first to arrive, hedged about by the members of his little party, and drove through the throng In the centre of a flying wedge. He climbed over the stage railing, followed by "Bill" Warr. who was to act as second and “Joe” Ward for bottle holder Perrins appeared a few minutes later, accompanied by Pickard as second and his brother as bottle holder. Established in opposite corners of the stage, the two men flung their hats in the air, the customary signal of defiance. Colonel Tarleton had been selected as umpire for Johnson and Mr. Meadows, of Birmingham, was to perform a like service for Perrins. The two gentlemen were stationed near the stage where they could call the half minute intervals between rounds and decide all disputes. Just before time was called one of those who occupied a favored position in the front ranks pushed his way forward until he was within a few feet of Johnson. At his hail the champion turned and recognized Mr. Bullock, a wealthy Londoner, who had led the applause for Johnson at many a ringside. Mr. Bullock signed to him to lean down that he might speak to him. "Tom," said Mr. Bullock, "I am going to bet heavily on you at whatever odds I can find." "Yes, sir" said Johnson with a grin. "I hope your interest will not be misplaced." "What I wanted to say was this: I know you will fight no harder for it. but if you win and bring my wagers home for me you shall share in the profit." "Thank you, sir." said the champion, "and handsomely offered. You are right to believe I will do my best by all means, but if anything could put more heart In me it would be your offer." Another man in the crowd, who had overheard part of this conversation, turned courteously to Bullock when it ended. "Pardon me," he said, "I am Mr. Seth, of Birmingham. I should be happy to accommodate you to any reasonable amount It you care to bet on Johnson after a few rounds." "I shall seek no further for a taker," said Bullock, smiling, and the two stood side by side, ready for the moment that should seem propitious to both. At the word from the umpires the two pugilists threw off their coats and advanced slowly toward the centre of the stage, where the square yard was rudely marked upon the turf. When each should toe his side of the square the battle would be joined. They walked lightly and confidently, allowing a moment for the thunder of cheers that was the introductory tribute of the waiting thousands for the gallant spectacle they presented. The disparity in size between the adversaries became startlingly apparent as they approached each other and the cheering died to murmurs of astonishment, every eye measuring the task -which the champion had undertaken. Perrins towered high above his opponent, emphasizing by his upright pose and upturned chin the great advantage he possessed in height, weight, breadth and length of limb. His skin was pink, his flesh firm and the muscles stood out upon him in knotted masses. He carried the instant impression of a conqueror by sheer superiority of strength as he looked upon his enemy with a quiet smile. He stood with his feet well apart, firmly planted, like one who means to seek no retreat. Johnson's lesser stature was more noticeable by reason of his stoop. He carried his head down and forward between his shoulders, while his knees were bent, ready for a spring in or back. He seemed in no wise daunted by the formidable figure before him. preparing for combat with a calm though serious mien. Beyond the difference in size there was nothing to choose between the two. Johnson was In the best of condition, looking unusually solid and fit. His close friends knew that he had entered this engagement with a full understanding of all the difficulties and that he had trained long and faithfully. In attitude the men displayed equal ease and skill The tumult died as with watchful eyes the pugilists took position, left foot upon the mark, and shook hands. Neither was disposed to take the initiative, Johnson through caution and Perrins because of some deference in the presence of the champion. At Length Johnson began the set to with a light swing that Perrrins blocked neatly. The Birmingham man countered easily and they exhibited some pretty sparring. Perrins showed he could foot it swiftly for his weight and shout after shout Greeted the clever shifting and rallying. Five minutes passed in this dalliance which served to prove the science and mettle of both. Meanwhile the blows gathered power as each man felt for the upper hand.. Perris opened the real hostilities with a ramming thrust to the chest that checked one of Johnson's nimble rushes. Instantly the tension Heightened and the shouting crowd fell silent again, for blood was up and the time for fighting came. The champion was not slow in answering the move. and ducking, he smashed two quick jolts to the body. Perrins, finding his enemy well within reach, swept a tremendous right at the jaw. Johnson ducked again and coming up caught Perrius under the ear. Perrius. not yet recovered from his futile blow, stumbled and fell, while a burst of cheers greeted the prowess of the champion. At the opening of the next round Johnson, still testing the abilities of his opponent, rushed in and came to grips, striving for a cross buttock. A very brief struggle was enough to assure him that his advantage did not lie that way. Perrins was too firm on his feet and far too heavy to risk a fall with so early in the game. Displaying great dexterity, the champion twisted away from the Birmingham man and returned to his former tactics. Hard blows were exchanged, though the champion very carefully avoided the full sweep of Perrins mighty fist Hurtling past the other's guard in an opening, he snapped back the giants chin and once more Perrins measured his length. Both men were somewhat breathed after this round and as they sat on the knees of their seconds were carefully washed and sprayed by their bottle holders. They came to the mark at the end of the half minute, however, fresh and ready. Johnson had worried out the weakness of his opponent by this time and greatly increased the speed of his movements, feeling that Perrins, for all his agility, preferred hammer and tongs to footwork. The Londoner began to circle and dodge, darling in and out. jumping hither and yon with catlike rapidity. Perrins followed him with resolution, but, turning a trifle too slowly, caught a crashing blow to the ribs that sent him again to the sod. The fourth round was very brief. Johnson repeating his manoeuvre and knocking his opponent, down cleanly for the fourth time. For all that the champion had had so plainly the best of it the Birmingham enthusiasts had not lost faith. Perrins had suffered but little in his falls. "Let him get in but one of those thumpers and Johnson is done." was the comment that ran among the craning and excited spectators. When Perrins toed the mark for the fifth round it was evident that he fully intended to "get in one of those thumpers." Johnson's prancing and shifting had finally irritated him exceedingly and his brow had gathered in a frown. rejecting the caution with which he had played his part thus far he opened with a rush, pursuing his opponent with determined swings and lunges which forced the champion to give ground and guard closely . Taking two smashing blows to the face he found his chance and sent Johnson spinning to the floor with a wicked blow to the jaw. The champions second and bottle holder ran to assist him in rising and owing to his evident distress took as much time as they safely might in carrying him off. This was a common method of improving the opportunity offered under the rule which directed the umpires not to begin the count of the half minute until both fighters were seated in their respective corners. Johnson had been badly cut about the face and needed constant attention up to the calling of time he came to the centre a trifle unsteadily. Perrins opened the sixth round as he had the last with a crashing swing, which Johnson only partially blocked. 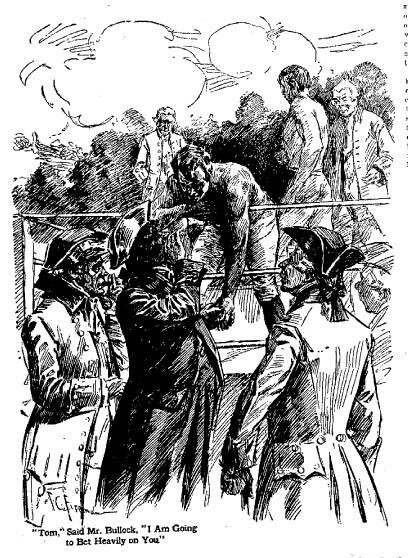 The Birmingham man then varied his method by closing with his adversary and wrestling Johnson was no match for him at this, and in the fall the champion was underneath though he was able to rise quickly. The seventh round Perrins introduced and ended with one terrible jab that caught Johnson full on the mouth and hurled him to the side of the stage with crimsoned face. The situation appeared to be reversed, and loud was the acclaim of the Birmingham supporters. But Johnson's friends were encouraged see him spring into the next round with renewed vigor. Only one of Perrins blows, the swing to the jaw, had injured him. and he was now recovered from its effects. He continued his swift and battling tactics, Confident that the wrath which had inspired his enemy's dangerous offence must soon wear upon his strength. Perrins still seeking to plant one of his sledge thumpers, made futile attempts to pass the champion's guard. Angered by his failure, he broke the silence they had both, maintained. "Come, man." he cried, "stand still and fight. I was not matched with a cricket." He lowered his arms an inch too far .is he spoke, and Johnson answered the taunt by leaping in with one of his famous blows that carried all the weight of his body behind it. sweeping aside the thrust with which the other sought to stop him. His right fist caught Perrins a slashing stroke over the left eye and the giant went down with a crash that shook the stage. It was a shrewd blow and one of the most effective known to the science of the day. The big man's eyebrow was laid wide open and his left eye was closed for the rest of the fight. His second and bottle holder worked over the hurt in vain. Perrins seemed well on the road to defeat when he came to the mark again, but he proceeded to even scores by one of the cleverest moves of the battle. Johnson having danced in too soon with a body blow, the Birmingham man chopped a savage back hander that landed full on Johnson's right eye. knocking him off his feet. When they faced each other for the tenth round it was with a sound eye apiece. The champion had learned at some expense that it was too soon to adopt offensive tactics with his huge enemy, and he returned to caution, husbanding his wind and his strength and closing twice for falls, in which be managed to escape without damage. The value of this was soon apparent, for Perrins was breathing heavily and seemed grateful for the respite of his second's knee. In the thirteenth round Johnson ripped home a "haymaker" uppercut that slashed open his opponent's cheek and nose and brought a howl of applause from his backers. Bets had been flying rapidly, the odds shifting with almost every round. At this juncture Mr. Seth turned lo Mr. Bullock. "If you feel like laying a wager now I am with you." he said. "I'll give you 100 to 10 on Johnson." said Bullock, readily. "Done for £20,000 if you care to go that far." cried Seth. Bullock hesitated Just a second, considering the champion's condition with careful eye. "Done." he said, quietly, accepting an obligation of a fifth of a million pounds sterling without a hastened breath. Repeating his previous success when nerved by a setback, Perrins bore in on the next round with a hammering stroke, that all but closed Johnson's sound eye. Both now showed the effects of the hard pace and the odds fell to even. Up to the forty-first round there was HI He change in the situation. Johnson began to develop more fondness for closing and wrestling, but Perrins avoided grips and knocked the champion down repeatedly. In the forty-first round they rallied a moment, when Johnson slipped and fell without being struck. Instantly Pickard, the second for Perrins, rushed to the rail. "We claim the fight on a foul," he yelled, and the Birmingham followers took up the cry. The umpires considered the matter and decided that the fight would proceed. Pickard was well within his rights according to the usual rule, but the umpires held that the rule could not be appealed to since it had not been included in the articles. On the resumption of the struggle Perrins altered his style of fighting in imitation of his opponent, stooping low And attempting to shift quickly and foot it. The champion meanwhile had at last decided to go upon the offensive, and the next fifteen rounds were the most severe of the terrific struggle. In the fifty sixth round Perrins landed a chopping back-handed stroke to the face that very nearly ended the contest. At this point each remained on the sod whenever be fell and allowed his attendants to carry him to his comer. It was also necessary for the seconds to support the combatants and load them to their marks in opening a round. Both the men were very weak in the next rounds, cut in a score of places and wheezing. Perrins was in the greater distress, his huge chest laboring like a bellows. Several times he got home his back-handers. but. Johnson learned to guard against them. Frequently Perrins was carried to the Sod by the force of his own miss spent, blows, each time Johnson watched him falling and hit him, falling at the same time himself. The champion was landing almost at will but weakly. When led to the centre for the. sixty-second round the combatants were weaving on their legs, almost blind. It was plain to all that one or both had approached the limit of endurance. Johnson was a trifle the stronger. As they fell on guard Perrins aimed a heavy swing at Johnson's head. It missed and Johnson planted a straight smash to his adversary's face. It was the stage of the contest when such a blow, Ineffectual earlier In the struggle, must prove decisive. Perrins staggered and fell, unable to continue, after having made one of the most courageous fights in the annals of boxing.The contest had lasted an hour and a quarter. Johnson shook hands with his fallen rival as soon as the latter was able to stand while the crowd cheered.No champion had ever defended his right to the title more conclusively or against a nobler opponent and every man on the field knew it. While Johnson was leaving the stage Mr bullock met him and handed to him £1000in recognition of his victory. IT is character and knowledge of character, which, together with strength and skill, makes boxing champions to-day. And we are inclined to think that the psychological element in fighting came in only within the day of gloves, and rather late in that day. Certainly the old records of the early Prize-Ring are of brawn and stamina, skill and courage rather than of forethought and acutely reasoned generalship, but there are exceptions, and one of the most noteworthy is that of Tom Johnson. Johnson (whose real name was Jackling) was a Derby man, who came to London as a lad, and worked as a corn porter at Old Swan Stairs. For a heavyweight champion he was very small short, rather: for he stood but 5 feet 9 inches. He must, however, have been made like a barrel, for he weighed 14 stone, and the girth of his chest was enormous. A story is told of how Johnson when his mate fell sick carried two sacks of corn at each journey up the steep ascent from the riverside and paid the man his money, so that the boxer's amazing strength earned the double wage. The best known and probably the fiercest of Johnson's battles was with Isaac Perrins, who stood 6 feet 2 inches and weighed 17 stone. It is not probable that boxers trained very vigorously in those early days, so that the weights may be misleading. Contemporary prints, however, certainly give the impression of men in hard condition. Perrins, a Birmingham man, is said to have lifted 8 cwt. of iron into a wagon without effort. The fight took place at Banbury in Oxfordshire on October 22, 1789. The men fought (it is interesting to know when we think of the prizes of the present day) for 250 guineas. Two thirds of the door money went to the winner, one-third to the loser. The men fought on a turfed stage raised five feet above the ground.
" which, in all probability, had he not have missed his aim, must have decided the contest, and Johnson been killed, from its dreadful force." But Johnson dodged the blow and countered with a terrific right-hander which knocked Perrins down. At that time prize-fighters stood square to each other with their hands level, ready to lead off with either. And in that position a man naturally fell over much easier than from the solid attitude of a few years later till the present time.The next three rounds were Johnson's, for Perrins was shaken by his first fall. Then Perrins gathered himself together, and by sheer weight forced himself, regardless of the blows that rained on him, through the smaller man's guard and knocked him down. And for several rounds in his turn Perrins was the better. He cut Johnson's lip very badly, so that he lost blood, and the betting for some time remained in his favour. Tom Johnson by this time had the measure of his man. The usual waiting game would not serve now. He must not only wait, but he must keep away, and in order to keep away, he must run away. This may not have been wholly admirable from a purely sporting point of view, but we must forgive Johnson a good deal (and as we shall see there really was a good deal to forgive) on account of his inches.
" He had recourse," says Egan, to shifting" that is, he kept out of the way for as long as possible, and then, as by the rules of the Prize-Ring a round only ended when one of the men went down, probably closed and let Perrins throw him. But the spectators approved of this method no better than they would to-day, and there was a good deal of murmuring against Johnson. At last Perrins, unable to reach his nimble footed antagonist, began to mock at him. "Why!" he exclaimed to the company at large,"what have you brought me here ? This is not the valiant Johnson, the Champion of England : you have imposed upon me with a mere boy! " At this Johnson was stung to retort, for he was no coward and was but fighting in the only way which his size allowed. Moreover, Perrins's observation roused his dander, and he blurted out.
" By God, you shall know that Tom Johnson is here!" and immediately flew at his man in a passion of rage and planted a terrific blow over his left eye, so that it closed almost at once. This incident nearly decides for us that Perrins was not much of a boxer. A wild charge of that sort, particularly by a much smaller man, is seldom difficult to frustrate. And the opinion of the crowd began to veer round. Those who had put their money on Perrins began to hedge. Undaunted by his closed eye, Perrins pulled himself together in the next round and returned as good as he had got, closing Johnson's right eye. And so for a while the fight remained level. Many rounds and very short ones. A half- minute's rest between. Much hard punishment given and got, but a great deal of it not of a kind obvious to the inexpert spectator. Quite apart from short arm body-blows which are sometimes apt to elude observation, there was wrestling for a fall with which far more rounds ended than with falls from a blow. The effort to throw is exhausting enough, but to be thrown and for a heavy man to fall on top of you is terribly wearing. 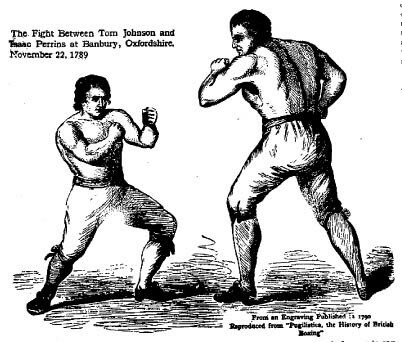 And though the strength of these two men was prodigious, yet Johnson was the closer knit of the two, from a boxer's point of view the better made. Now when they had fought forty rounds, Johnson was confident and happy, but he knew that he was pitted against a lionhearted man who was by no means yet worn out. Suddenly he got an opening for a clean straight blow with all his weight behind it. This was a right-hander, which struck Perrins on the bridge of his nose and slit it down as though it had been cut with a knife. The odds were now 100-10 on Johnson, but he had by no means won the fight. Perrins was boxing desperately, striving with his great superiority in reach to close Johnson's remaining eye. He knew very well that many a fight had been won like that, an otherwise unhurt man being forced to throw up the sponge because he was totally blinded by the swelling of his eyes. In the forty-first round Johnson either slipped down or deliberately fell without a blow and Perrins and his backers claimed the victory. If Johnson did actually play this very dirty trick to gain time and have a rest, he deserved to lose. We don't know what actually happened. The records merely state that he fell without being hit. But the umpires allowed it because that contingency had not been covered in the articles of agreement made before the fight. Perrins now changed his method, attacking his man with chopping blows presumably on the back of the neck and head, and back-handed blows which are seldom efficacious. These puzzled Johnson at first, and he took some of them without a return until he learned the knack and guarded himself. And Perrins's strength now began to go: while Johnson, who for a few rounds had seemed tired, began to improve again. But yet he never began the attack. He left that always to the giant. In fact, Johnson did everything to save himself and to make his man do most of the work. Then Perrins, who had lunged forward with a terrific blow, fell forward, partly from his own impetus, and partly from weakness. Johnson, who had stepped aside from the blow, watched him and as he fell hit him in the face with all his might, at the same time tumbling over him. After that Perrins was done. Every round ended by his falling either from a blow or from sheer weakness. Johnson hit him as he pleased, with the consequence that Perrins's face was fearfully damaged, "with scarce the traces left of a human being." But he refused to give in, and round after round his seconds brought him to the scratch, when he swayed and staggered and struggled for breath and tried to fight on. His pluck in this battle was the inspiration of the Prize-Ring for ever afterwards. More than once Johnson, still strong, sent in tremendous blows which would utterly have finished lesser men, but Isaac Perrins held on until his friends and seconds gave in and refused to let the good fellow fight any more. The match had lasted for an hour and a quarter, during which sixty-two rounds had been fought. In many ways it was an unsatisfactory fight, but for cunning (if rather low cunning) on one side and magnificent courage and determination on the other, it must be counted one of the greatest combats of the old days.